Start reading The French Photographer on your Kindle in under a minute. Natasha Lester worked as a marketing executive before returning to university to study creative writing. She completed a Master of Creative Arts as well as her first novel, What Is Left Over, After, which won the T.A.G. Hungerford Award for Fiction. Her second novel, If I Should Lose You, was published in 2012, followed by A Kiss from Mr Fitzgerald in 2016, Her Mother's Secret in 2017 and the Top 10 Australian bestseller The Paris Seamstress in 2018. The Age described Natasha as 'a remarkable Australian talent' and her work has been published in numerous anthologies and journals. In her spare time Natasha loves to teach writing, is a sought after public speaker and can often be found playing dress-ups with her three children. She lives in Perth. For all the latest news from Natasha, visit www.natashalester.com.au, follow her on Twitter @Natasha_Lester, or Instagram (natashalesterauthor), or join the readers who have become Natasha's friend on Facebook. I have no idea where to start with this book, what an intensely, powerful, beautiful, emotional and moving story that was so hard to put down, yet I read slowly and savored every word, as I journeyed through World War 2 with Jess and Dan and then 2005 I got to know D’Arcy as she un-ravels some secrets that cause some more heartbreak but also opens hearts to forgiveness, keep the tissues ready. Jessica May is modeling for Vogue in New York in 1942 she is a beautiful woman who is open and honest and a very talented photographer and journalist as well and gets an assignment as a photojournalist in Europe to cover the war, here she meets many other female photojournalists and the way they are treated is hard to take, but friendships and strong bonds are formed with people like Martha Gellhorn and paratrooper Dan Hallworth, who actually knows how to treat these woman that get the stories told with heartfelt emotions, Jess gets photos that will still be printed years later they are beautiful and special, she also meets a little girl Victorine who is living in a field hospital and the special bond they have is amazing and special. But emotions run high, hearts are broken and yet love survives. 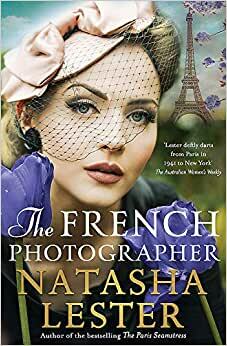 In 2005 D’Arcy Hallworth daughter of Victorine, is sent to a chateau in France to gather some photos from a famous collection to bring to Australia for an exhibition, this has D’Arcy uncovering who the photographer is and discovering the link that she has to this person. The photos are opening up so many emotions for D’Arcy making her wonder about the past and what she can do try and see some things right, and there is Josh as well someone for D’Arcy to lean on. I don’t think I am going to forget this story for a long time to come, I am still tearing up thinking about what to write in this review, I can say that it is a book that is a must read, it really has left me speechless in its telling of a woman who was determined to be heard in times when woman weren’t heard well and the things that happened during a terrible time in history and then the love between Jess and Dan that although had so many things thrown at it did last for them both, I loved the courage and strength that was Jess and the forgiveness that was needed and given, yes this is one I highly recommend.